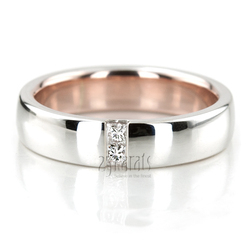 Rose gold interior completed with white gold surface and both band is set with sparkly princess cut diamonds for selective couples. 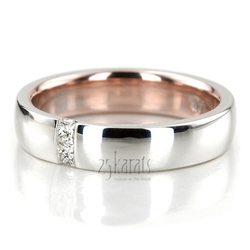 This gold two tone band set can be built for the color of your choice, simply let us know. Each band set with 0.10 ct. t.w. diamonds. 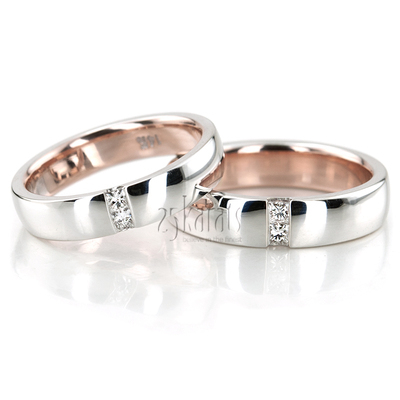 Diamond size 1: 2 pieces x 2x2mm Princess cut with Channel Set - G/H Color - SI1 Clarity - 0.1 ct.tw. Diamond size 2: 2 pieces x 2.25x2.25mm Princess cut with Channel Set - G/H Color - SI1 Clarity - 0.14 ct.tw.